So, a long time since I last posted any blog content. 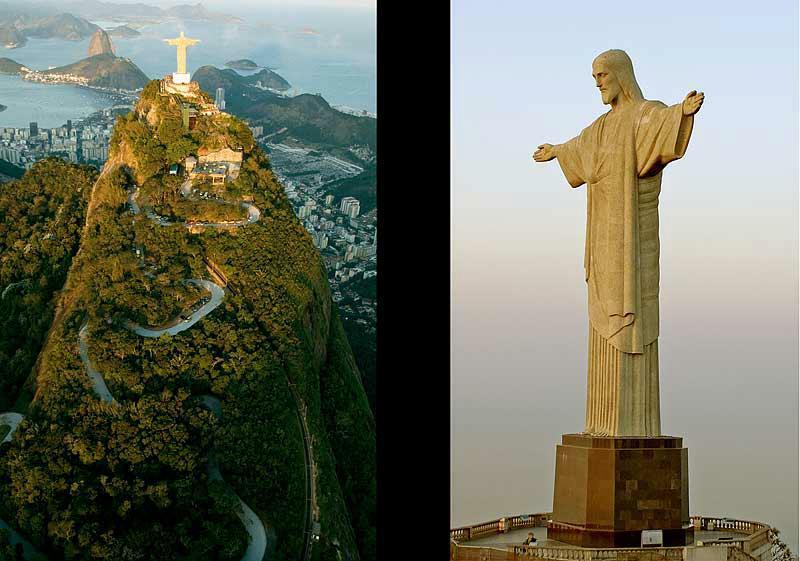 Since October I have been preparing for and then travelling in Colombia, Peru and Bolivia before we got to Brazil a week ago. Whilst en route I was in touch with Charlie Dark of London's Run Dem Crew about trying to hook up with some Rio runners. Luckily he had been over in Rio earlier in the year and made contact with 2 running groups. Charles Silva of Coletivo Briza got in touch and emailed me whilst in Colombia suggesting we join him and his group of friends who run with Nike Coisadaboa in Copacabana every Saturday. He challenged Anna and I to try the annual race from Lapa to Christ the Redeemer, the highest point overlooking the city, which 500 runners (or nutters, depending on your point of view) take part in. The route is 12 KM and run in the early morning to at least make it more a little more bearable from the scorching Rio heat. Having chatted with Anna about whether we wanted to put ourselves to the challenge whilst on holiday, we decided it was too good an opportunity to miss. Having also hiked a lot at altitude in Peru, we thought if we hadn't run for a month, we would have a little advantage at sea level running uphill! Deep down we were both nervous and not sure of how our fitness would help or hinder in much different conditions than we were both used to. Getting up early we went to the famous Lapa arches to meet Charles for the first time and prepare to race. Wearing my VPH colours with my name on my vest stuck me out from the crowd so Charles could find us. The race organisation was much different from English races. People were given their numbers from one guy half an hour before race start and runners were still milling around without a clear indication of where the start line was. Luckily we were stood in the right place and before everyone properly gathered, some keen runners moved to under the arches and started the race in the direction of Santa Theresa! We were still chatting to Charles friends from the Nike club when we saw the lead party go so joined the throng to make sure we would be able to follow the route. At first we turned up a hill on a cobbled street and got used to the race pace. For anyone in the UK has run in the Hastings half marathon, the hills at this point, for the first 4 or 5 Kilometres were about as challenging as in the Hastings race. A little testing, but nothing too hard. Once past the suburb of Santa Theresa the route flattened out as you looked down to the East of the city, climbing along a hill edge shielded by forest on either side. As you saw down to the city through the trees, you were nicely shielded from the sun which was beginning to burn brighter (it was about 9.30 by now). The humidity made it sticky and my vest was already baked to me in a lovely clammy manner. I was thirsty despite having quaffed a litre of water just before the start. Luckily 2 drinks stations meant we didn't suffer too much. I found my pace and followed Charles instructions to go easy on the hills, and then accelerate on the flat. I didn't have my Garmin as Anna borrowed it for the race, but I could see from my wristwatch my rough time. I was using Charles PB of 1 hour 15 from the previous year as a guide to try and aim towards. Everyone had said that the last 2 miles were the worst so I tried to conserve some energy for a big push to the end without going too fast. With no mile markers though, I was running blind (as it were), but pleased with my efforts, not feeling too exhausted. We got to a point where the road turned into the national park entrance to let buses up to the Christ statue, and I foolishly thought that might be the 10KM point.... Things still felt good, so I pushed on, awaiting the gradient to really start. I'd kept my place in the race with the odd runner overtaking once past Santa Theresa, and I did nick the odd place back myself. Then the hills REALLY started. I slowed but aimed to keep going up the hills slowly, just faster than walking pace. I guess I managed to keep this up for half a KM, then it was so steep I could barely run, so walked 20 metres or so, got my breath back and then even slower got the 'running' going again. Tiredness bit again. I walked 20 metres, then ran, then walked, and then I thought, "Sod this. I'm going to keep running, even if it is snails pace," zipped up my man suit and dug in. The steepness was unrelenting. I had no idea whether it was 2km or 5. I kept catching a glimpse of Jesus, and he seemed to be getting nearer. I knew it wasn't too much further. I kept up with a couple who were just a bit quicker than me. We passed another water station. Not much further surely? Then we hit what I could tell would be the final leg. I saw my watch. I'd be running over hour and thought I'd be lucky to be near Charles time from 2011. I turned one more bend, Jesus was much nearer. Some fast finishers with medals were jogging back down the hill past me. I kept going. Turned a bend, saw the finish and found one last push. There was no finish line! Just a guy giving out medals, another giving out water, and another fruit. I couldn't see the compadres from Charles group. I couldn't believe it. I'd kept my pace from the start and looked at my wristwatch. 1 hour 15 minutes. I'd done it. Stripped off the vest, put on my medal and waited for Anna and the crew to come also finish. 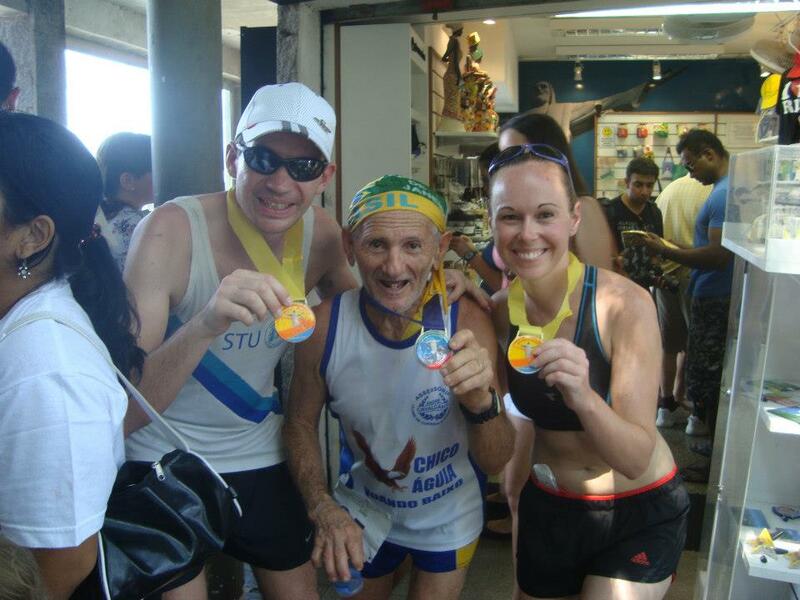 Our favourite finisher, Chico Aguia, a veteran legend of Rio (see left), of 72 years came round the finish bend with another runner five minutes after me, crossing the line with a Brazilian flag. All of the finishers cheered loudly, and he did 10 press ups to show he wasn't done just yet! It was a fantastic race, one that I feel very privileged to have competed in (and completed!) and we chatted all the way to the statue and back home to our new found Brazilian running crew. If you get the chance you have to do this race - the first Saturday after Christmas, then I have no hesitation in recommending it. The view as you'll see below, is worth all that effort by the end. I would say in its own way, its as challenging as a marathon for the reserves of mental fortitude that are required, particularly if you're from Northern Europe! Thanks Charles and all of the Coisadoaba Nike team.